« UN warns of possible ‘worse war’ to affect Syria–what does the Bible teach? The Christian Passover for 2016 is Thursday evening, April 21st, after sunset which is when the 14th of Nisan begins. Notice that the Apostle Paul is basically teaching that examining oneself before taking Passover is required. He also is teaching that if you will properly judge yourself you would not be subject to certain other judgments, and likely would be healthier. While the above warning has had application throughout history, it is intended specifically as a warning to end time Christians, the bulk of which are unknowingly Laodicean. And those that do not believe that they need to change are in real danger of being Laodicean. Those who compromise, which most in the COGs do, are Laodicean. Is not now the time to consider this? In JUST a short while YOU will be sitting down with a very select few people on this earth to partake of the PASSOVER. The Passover is a memorial of the death of Jesus Christ, the Savior of the world. Partaking of the symbols of His broken body and shed blood means that YOU hsve been selected to know and understand God‘s purpose. Being chosen as one of the ELECT to know God‘s truth carries sobering responsibilities. We cannot approach this event lightly. God wants us to isolate a very basic and elementary perspective each year at the Passover. He wants us to focus on that elementary concept as we begin again to relive His plan of salvation for mankind. That elementary concept IS salvation. That’s what His plan is all about, whether it relates to US or the world. Therefore, brethren, the Passover is a time for us to once again get down to the elementary precepts of our OWN salvation – our OWN relationship to God and His Work It is a time to examine OURSELVES. A time to look at YOU. We can get so absorbed in our work or in the “deeper things,” the seemingly “important” things, that we can forget WE have to get and keep OURSELVES right with God. That’s what the Passover is all about. There is never a time we can allow ourselves to get so busy or so important in our own eyes that we no longer need to get deadly serious about the elementary concepts of salvation that we so intimately associated with the Passover. No matter how long we have been in God’s Church or how spiritual we have become, we are still human beings with human nature. Not one of us will ever come to a place in this life when we can afford to forget what we are. Just before the Passover we should take another look – a long, good look ! “The carnal mind is enmity against God: for it is not subject to the law of God, neither indeed can be” (Rom. 8:7). Yes, this is the kind of nature all human beings have! And this is the time of year to especially remember that fact. It is also a time to rehearse and reaffirm what you have done with the knowledge that you have that kind of nature. When God saw this genuine, heart- felt attitude, He put His Holy Spirit within you and begot you as His own child. But that isn’t the end of the story! God wants us to comprehend the REAL DEPTH OF THE EVIL, WICKEDNESS AND DECEITFULNESS that is in us. God is allowing us to live on WITH our fleshly natures and in an alien environment to teach us how really and profoundly EVIL we have been – and how often we still fall short. We know that we have crucified the old man to the intent that. the body of sin (our very nature) might be destroyed (Rom. 6:6). We know that once we are resurrected or changed at Jesus’ return, we will be freed from this kind of nature (verse 7). But, until that time comes, we must reckon our- selves to be dead indeed unto sin, and living the righteous life (verse 11). The struggle then begins to “let not sin therefore reign in your MORTAL body, that you should obey it in the lusts thereof” (verse 12). 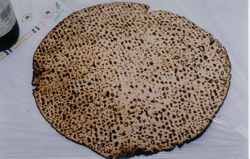 Be READY to take the Passover! And that is part of why we need to examine ourselves. For more information, you may wish to watch the video Preparing for Passover. The Christian Passover for 2016 is Thursday evening, April 21st after sunset which is when the 14th of Nisan begins. The time to prepare for it is now. Is There “An Annual Worship Calendar” In the Bible? This paper provides a biblical and historical critique of several articles, including one by WCG which states that this should be a local decision. What do the Holy Days mean? Should You Observe God’s Holy Days or Demonic Holidays? This is a free pdf booklet explaining what the Bible and history teach about God’s Holy Days and popular holidays. This entry was posted on Tuesday, March 15th, 2016 at 12:01 am	and is filed under COG News, Doctrine. Passover is almost here: Have you examined yourself?